The first look at the new Audi A6 in India made me think twice whether it is an Audi A8L or A6 that I have been given for the test drive. But then going over to the sides of the car made me realize that this is an A6 and not the A8L. For 2011, the front has been slightly reworked and gets a mildly tweaked front bumper and the head lamp design. The head lamps are now all LED along with the DRL or daytime running lamps flanking them. The fog lamps are miniscule and sit deep inside the air dam pallet. There is an extended lip spoiler as well here. The 17 inch alloy wheels with low profile tyres make a good design appeal on this car. The wing mirrors however felt a bit useless kind of in the wake of their design. Nothing appeals much here. The 2011 Audi A6 in India unlike its peers hasn’t grown in size. Infact it has reduced weight by upto 80 kgs and has got its length shortened as well. The roofline towards the rear is now more coupe like and the tail lamps are a bit in your face kind of thing. This tail arrangement actually resembles that of the Jaguar XF 3.0D that I recently reviewed. The twin tail pipe arrangement looks cool as most of the Germans abstain from using them in India. There is a rear diffuser as well giving the hints that the engine is placed in the boot. But there is nothing of that sort happening here. While the exteriors may feel conservative to some, the interiors is what only a selected few would call as conservative. The length chopping which I spoke of for the exteriors doesn’t reflect inside. Infact the enhanced wheelbase, approximately 69 mm from that of the previous variant, does show in the interior space. I have always maintained in all my reviews or test drives that Audi makes one of the best cabins in the business and the 2011 Audi A6 in India just emphasizes on that. Three different colors are used for the interiors and those consist of beige, gray and finally wood finish. I know the last can hardly be called as a color but then it blends nicely into the overall cabin appointment. But the wood insert doesn’t feel any better than the one in the BMW 7 series. 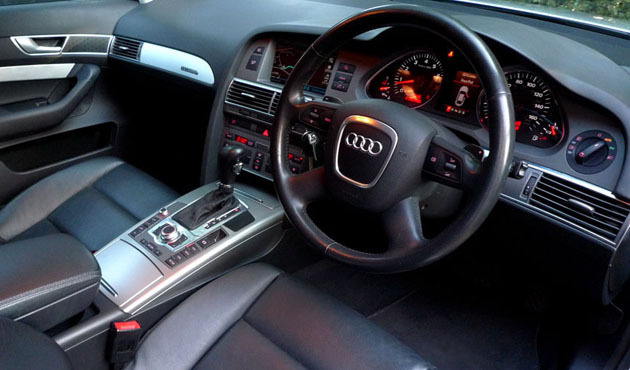 Audi have packed the new 2011 Audi A6 with class leading technologies.There is a headsup display coming out from the dashboard which displays the various menus from the latest Multi Media Interface or MMI system. The top of the line variant which I had with me was packed with a 12 CD changer Bang and Olufsen music system, dual zone climate control, fully powered front seats with heating and cooling properties and a navigation system. There is a rear view camera and also a touch pad for the MMI system. As expected, the seats are very comfortable and the rear ones also mirror the front ones as far as comfort is concerned. Space seemed a bit less than what the E class offers but Audi have wisely chosen to thin out the A-pillar to give the sense of spaciousness. Boot space is at par with the competition and no A6 owner is going to use the 60:40 split seat arrangement for sure. Being 80kgs lighter than the previous generation model has been achieved with the use of more aluminium in the chassis of this car. From the short drive that I had, I can tell you that the handling of this car is now more in tune with that of the BMW 5 series. The steering wheel however leaves a lot to be desired with its sort of numb feeling at the center. This is the same one as checked out in the Audi A8L. It devoids one of the actual feel of the car. Ride quality is superb if a bit jiggly at low speeds but that can be taken care by the comfort mode suspension setting from the MMI interface. Even though the model that I was driving was a diesel variant, it barely made a noise inside the cabin. This makes for one relaxing drive. 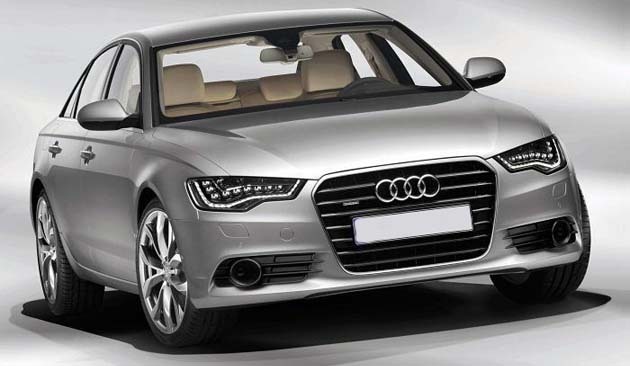 The 2011 Audi A6 in India will have 4 engine options. Two petrols and two diesels. The petrol motors were a 2.8 FSI developing 204 Bhp whereas the 3.0 TFSI has a peak power output of 299 Bhp. The diesels on the other hand consist of a 2.0 liter turbo with 177 Bhp and a 3.0 liter Tdi with 245 Bhp. The latter was the model that I had with me on test and its acceleration literally blew me away. It was mated with a 7 speed S-tronic dual clutch transmission. Gone is the jerkiness usually associated with such transmission and save for the occasional hiccups, the transmission was silky smooth. 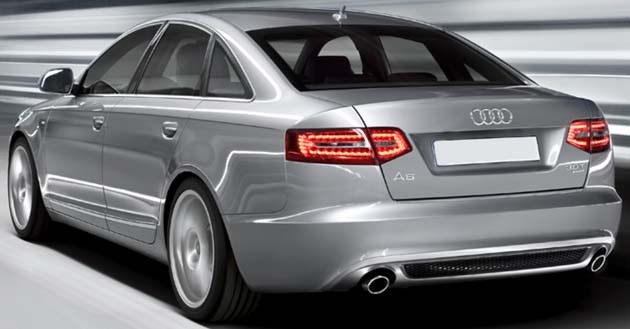 Expect the 2011 A6 to power its way from 0-100 kmph in only 6 or 7 seconds. It has got Audi’s patented Quattro all wheel drive system for reigning in all this power. Up rated disc brakes at both the ends also make a good stopping poise for this car. EBD, ABS, ESP and many other electronics assist the brakes in stopping the car. Active Lane Change assist, night vision, adaptive cruise control, 6 air bags and seat belts with pretensioners comprise the safety package. With its lighter weight and aerodynamic size, the 2011 Audi A6 in India will have better fuel efficiency than its predecessor and even the competition. The new model also features a start stop system and has got thermal management concept and energy recovery system added onto its powertrain. The 2011 Audi A6 in India is a sea change from its earlier model. It has still got conservative looks however the interiors are even better than before with more space and at the same time reducing the footprint. It has got many gizmos and I sincerely hope that the Google Earth application makes its way into the cabin of the Audi A6. It has got an almost good ride and handling package save for the lifeless steering wheel. The engine is powerful and so is the seamless transmission. Moreover, Audi were quick to tell that the price for the new one wouldn’t be much more of the mark set by the old one. The 2011 Audi A6 price in India is estimated to start from Rs 40 lakhs and would be stretched to Rs 52 lakhs for the top end variant. As reported earlier on, https://www.indiandrives.com/audi-a6-the-latest-from-the-german-giant-to-hit-indian-markets-this-diwali.html, the 2011 Audi A6 would be launched in India by September 2011 or by Diwali time.